Traveling has opened my eyes to a whole world of what to pack, what to wear and what to purchase at the drug store before a big trip. 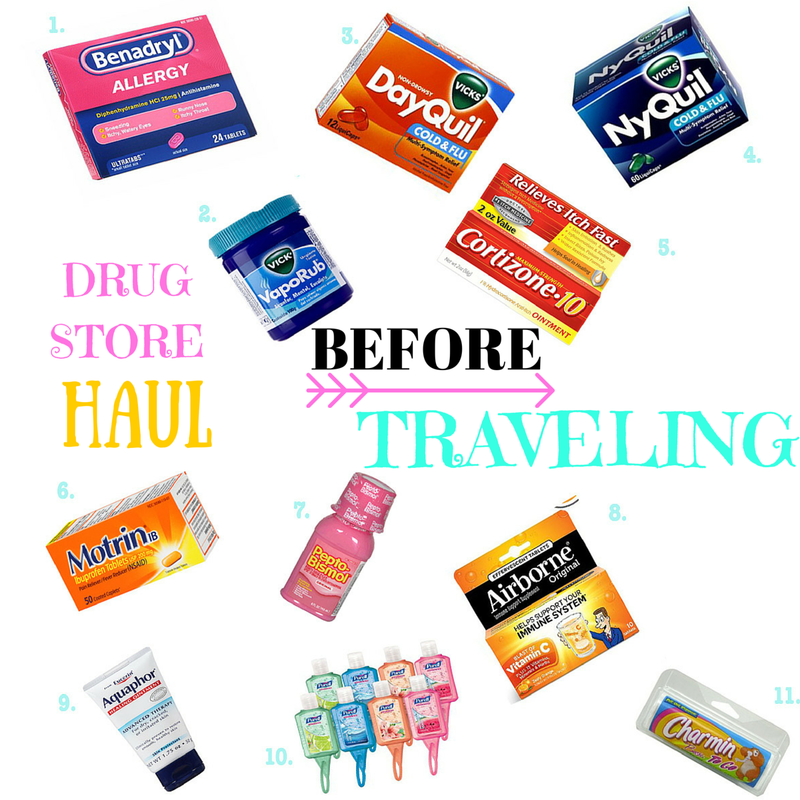 I have been traveling extensively for the past five years and I got sick several times. The first few years of traveling I was never prepared. I have a lot of strange allergies (to some foods and plants) and traveling carefree usually gets me into a lot of trouble. I have had swollen face and eyes. I have been bitten by bed bugs and sand flies. These are just a few of the incidents, that have happened while I was busy YOLO-ing. These days I am ready for any and everything. Here are some of the things, that have saved me when I do get sick on an adventure. Also, these are things that are not readily available in most countries or has a totally different name. Benadryl is number one because you never know when you may have a reaction to something in the air or in the food you ate. My friend and I got bitten by bed bugs in Kuala Lumpur, Malaysia and had a hard time finding a pharmacy and then a hard time explaining what had happened to us. We ended up getting what we needed, but if we had some Benadryl handy we would have had more time to enjoy our vacation. Vicks is amazing and there are so many uses for it. From decongestion to warding off mosquitos. That can be blamed on its strong scent. Just writing that sentence gave me a slight tingle! Sometimes after long a flight, I am very congested and this always does the trick. This is not something that can be picked up everywhere, so pack it if you have trouble with congestion. This is an absolute must, especially if you plan on traveling somewhere, where the weather is cold or just starting to change. This is not sold in every pharmacy around the world, but it it is one of the best when it comes to alleviating those early signs of a cold. Of course, Night Quill is recommended, too. This will knock a 300 lbs Samoa wrestler out ( I am not sure, but that sounded great). It can take such a toll on your body if you have a cough the entire night and this will help you feel better. This is also, not something you can just pick up at the drugstore. For example, in Korea if you have a cold, then the doctor will give you 3-7 days worth of a cocktail of drugs. Usually, I have no clue what I am taking and usually all I need is a little night quill and a night's sleep. You never know what will happen while you are frolicking in the ocean, rolling around in the sand or hiking. Each time I've visited Malaysia, I have gotten bitten by some kind of water bug. I could not even see them. After swimming my skin is usually itchy. Truthfully, the itch didn't last long, but this stuff would have been helped. This one is embarrassing for most. I will speak about this briefly. Here is the scenario, one second you are eating the tastiest curry Sri Lanka has to offer and the next thing your stomach starts a live show in the restaurant. This is natural, but embarrassing, as well. Bring a bottle of two on your trip. I am not saying this will cure your runs in India, but it may help a little. While jetting of to new countries can be exciting, we never think of how it will affect our immune system. Yes, our bodies can fend off a lot, but airborne can give you that piece a mind. I usually use this prior to the flu seasons to help keep my immune system strong. This is like Vaseline, but better. Great for burns or keeping skin moist during cold months. It is very hydrating. Dab a bit on your lips elbow, knees and heels in both winter and summer. You will be ash free all year round. Travel size is a must and it lasts forever. When you are traveling it is important to wash your hands because let's face it most people do not wash their hands after using the bathroom. If you are in the window seat, chances are you don't want to get up wash your hands in between meals. Hand sanitizer will save you! Also, I teach young children and I have sick students all the time. Also, someone is usually digging for gold in their nostrils. Don't you dare judge, we have all been there :D Hand sanitizer is not easily available overseas, so load up on those travel sizes. This is paramount! Travel tissue packs for your purse or murse if you are a guy. Some places will not have toilet paper, so I usually have a pack of travel tissue in my purse. Unless you prefer not to wipe your private parts, then take my advice and have a travel tissue pack with you at all times. Thank me later! If you don't speak the language then use your body language to get what you want from the pharmacy. It works like a charm all the time! I have been there and the worst thing that can come from embarrassment is having a good laugh about the situation and never panicking. I hope this post was helpful to you and please leave your comments in the section below. 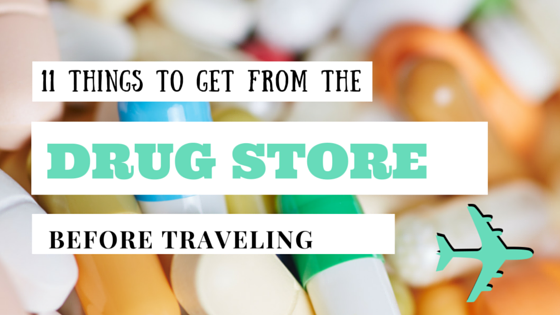 What do you usually get from the drug store before traveling? Please leave a comment below if this was helpful!